10 + 2 = ? : (Required) Please type in the correct answer to the math question. We were ready to headdownstream at 7:30AM but there was thick fog over all of East Tennessee. We finally got going about 9:30 when it cleared up a little, but it wasn't until 1120 that the fog lifted completely. At that point we were able to see the wall to wall mansions along the river clearly and even saw some we hadn't noticed on the way up. Arriving at 200 I called Enterprise and had a car ready to go shopping at 3:00PM. We went to Wal-mart and stocked up on food and then a liquor store in another county to restock our wine closet. 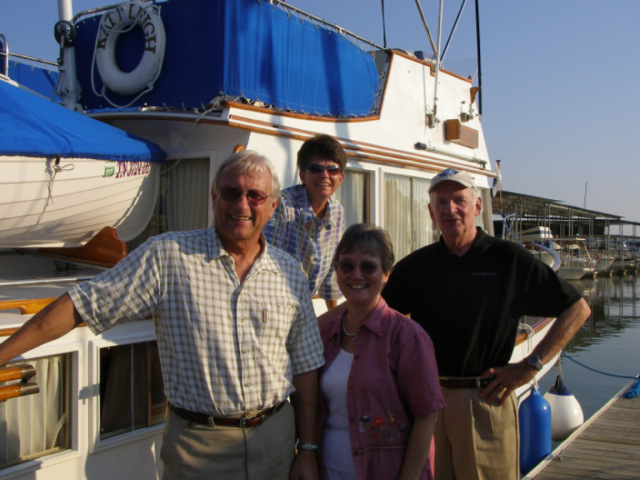 Tom and Patty arrived on the sailboat while we were out shopping and at 5:45 Ron and Eva Stob (founders of America's Great Loop Cruisers Assocation) arrived by car (see photo). We all went to Calhouns for dinner. Tomorrow we will visit the Stobs home on the Little Tennessee River also known as Tellico Lake.